*a sigh of relief* It’s about time. Every time I entered my father’s Explorer or friend’s Escape, I couldn’t bear the sight or navigation of Ford’s infotainment system. I’d like to think I was just spoiled by Chrysler’s Uconnect in my Cherokee, but that wasn’t the case – Ford and Microsoft didn’t work together. Picking up BlackBerry may be a bit risky due to the company’s decline in cellular device sales, although their technology and design is worth noting. They will be making Sync 3 more user-friendly, being able to sync with all software platforms. 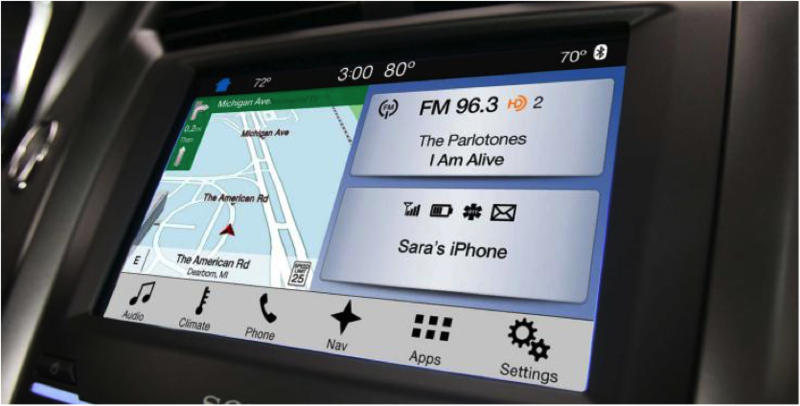 Sync 3 will keep the same 8-inch screen as MyFord Touch had, as well as an increase in voice functionality, larger text and touch zone, and a brighter display. There will also be a menu to the side of the screen instead of boxes with all the options. This makes the screen less clunky and easily accessible. A very convenient component of Sync 3 is that it can sign into your home Wi-Fi and update the system itself – something many infotainment systems are missing. Sync 3 will begin to roll out into Ford’s vehicles beginning 2016. As 2016 begins and Sync 3 is distributed, there will still be options for MyFord Touch in lower trim models.